In honour of Sepia Saturday we briefly return to Madison Square Park to look at the Statue of Liberty, or at least a (very important) part of it. How I wish to be able to walk through 19th-century New York. Last night I watched the US Celebrity Apprentice, I noticed these kind of carriages are still in use apparently (note to self: must visit NY soon). I guess it would cost a lot more than 50 cents if it were possible to climb the arm today. Until I saw the second picture I thought the hand and torch in the first was a photographic trick. I never knew that they displayed the arm and torch like that. I think it would be a cool idea to create a reproduction of that part of the statue today. Wouldn't it be fun! Especially a carriage ride, and taking a famous walking tour when they take you back into the days of long ago! Great Sepia Saturday post! Thanks! Fascinating, I never knew that. Love the first picture ... looks completely unreal and slightly spooky. How interesting! It was a clever way to raise funds. Wow, what awesome pictures!!! I did my post on the Statue of Liberty too. Thanks for sharing. I think I'll add your blog link to my post. I wonder if they had the stairway open so you could climb up to the torch when it was in pieces like this. Those carriages still get used in tv shows and movies. Rides around and through Central Park. Thank you! It takes a lot of time but I enjoyed the SS (hmm this abbreviation is not so nice). How neat! I never knew this either that it was on display this way, learned something new! Thanks for teaching me something today, Rob! I had no idea that the statue was "marketed" this way. And I agree with you completely -- I think it would be wonderful to walk through 19th century New York. I always think that when I see photos of the Easter Parades. Fantastic post! Very interesting story and photos. I agree with Bob I thought it was a photoshop work. Can't see it that way up on the statue for sure. Great post. How fascinating. I was in NYC in June and was offered (at a cost) several rides in such carriages. I managed to reject all such offers. It is amazing that a photo of this survived! If they weren't able to raise funds back then, maybe this arm will still be there. 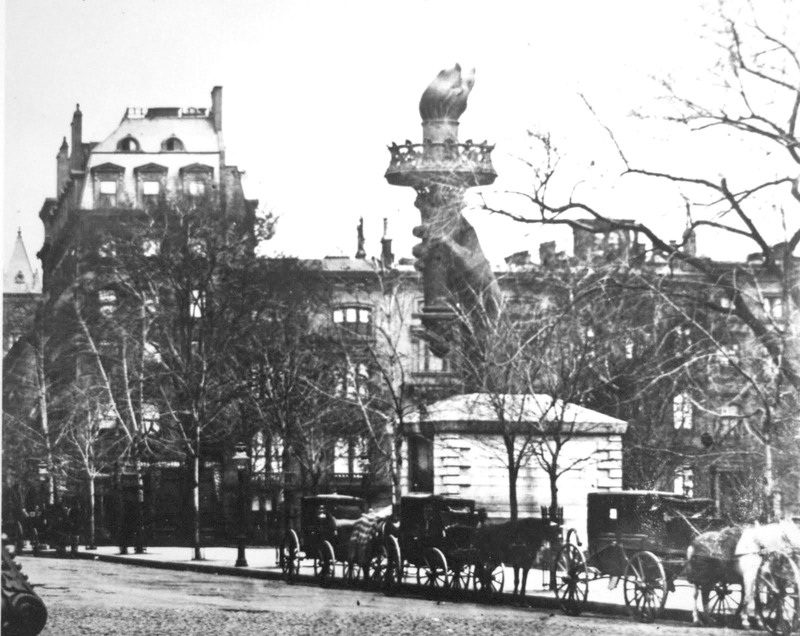 Now the Statue of Liberty became one of United State's best tourist attractions. 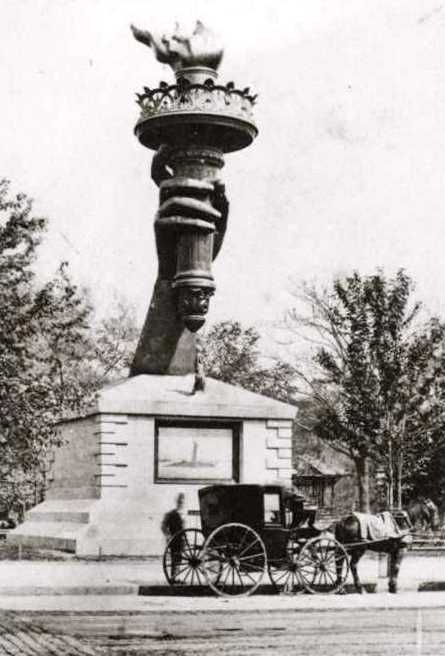 The torch and small building were first displayed in Philadelphia, at the 1876 Centennial Exposition, and were later relocated to Madison Square Park when the Centennial Exposition closed. The display in Philadelphia was identical to this - and for the same purpose, fundraising for the base. No, unfortunately not. There was a plan to go this year with my uncle and aunt (the brother and sister of my late mother), but my aunt ran out of money. I'd never seen that pic of Lady L. before!